How much of your country would you say is foreign-born? With Europe's refugee crisis still making headlines, the issue of immigration is never out of the news. Can receiving countries cope with the numbers arriving? Are immigrants a boon or a burden? How will new arrivals integrate into their adopted homes? But amid all this debate, one point is very rarely mentioned: everything you think you know about immigration is probably wrong. Or if not everything, at least one very important part: the numbers. There's a very good chance you think there are more immigrants in your country than there actually are. 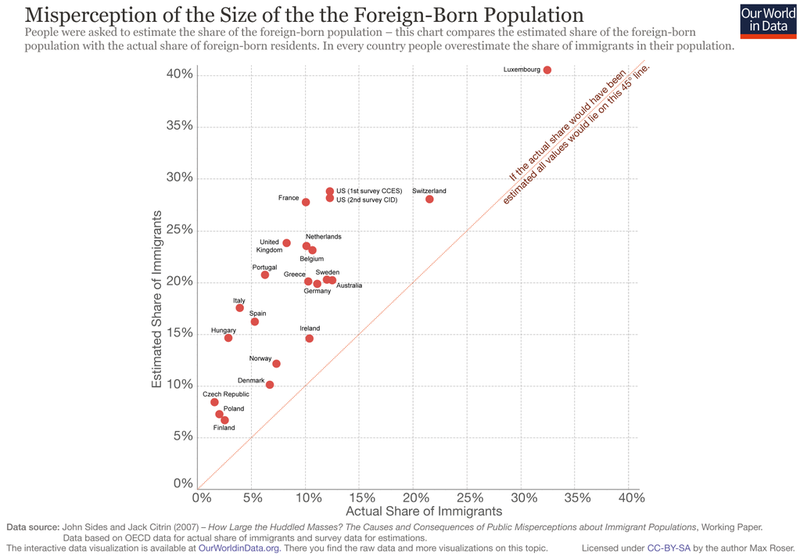 Political scientists John Sides and Jack Citrin used data from the US, Europe and Australia to compare the estimated shared of the foreign-born population of a given country with the actual share of foreign-born residents. This chart from Our World in Data shows the results. In every country surveyed, people overestimated the number of immigrants. The red line shows where the actual number would be, with people in countries furthest from the line making the biggest overestimations of the share of immigrants in their population. Among the nations surveyed, the French were the furthest out in their estimates: while only 10% of people living in France are foreign-born, respondents thought immigrants made up 25-30% of the country. Countries with a smaller proportion of immigrants in their populations appear to have a more accurate idea of the true numbers. People in Finland and Poland estimated that 5-10% of residents were foreign-born, which isn't far off the real figure of 5%. Many European countries vastly overestimate the size of their immigrant populations, including the United Kingdom and Portugal, which have a 5-10% share of immigrants in their populations, and not the 20-25% predicted by those answering the survey. In the US, respondents in two surveys guessed that the immigrant population stood at 25-30%; in fact, it is only 10-15%. Sides and Citrin found that national attitudes about immigration appear to be based on deeply ingrained beliefs rather than facts. “Factual knowledge or beliefs are secondary in attitude formation,” they write, which may explain misperceptions about the size of immigrant populations around the world.